We have listened to and written about the story Oliver’s Vegetables, which is a wonderful story about a little boy who only likes chips! The children discussed their favourite vegetables and we chatted about trying new foods. 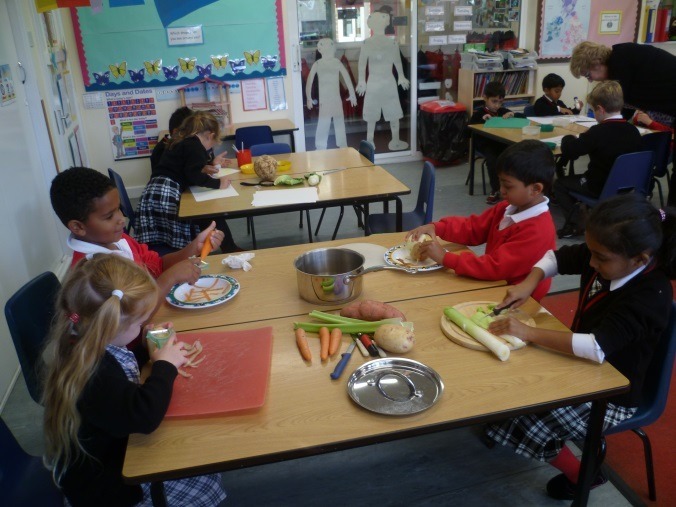 We went on to prepare soup by washing, peeling and chopping vegetables and trying not to cut off our own fingers! Henry thought that the soup was ‘lovely’. Keir gave it a 10 out of 10. Rohan said that it tasted sweet which must have been the sweet potato. Max M said ‘it is sticky’, and Adi said that he did ’love it! ’ William, Keir, Max K, Finn, Aarav and Olivia even went back for seconds and finished it all up!